TEA BENEFIT In many countries such as Iran, Hibiscus tea is prescribed as a blood pressure regulator. Hibiscus tea has a high concentration of organic acids (15-30%). The three organic acids that have been identified are citric, malic, and tartaric. These have been known to give an overall boost to the immune system. Rosehip is used for stomach disorders including stomach spasms, stomach acid deficiency, preventing stomach irritation and ulcers, and as a "stomach tonic" for intestinal diseases. DESCRIPTION Rosehips are fruits of the wild dog rose while Hibiscus is the Chinese rose in Asia. 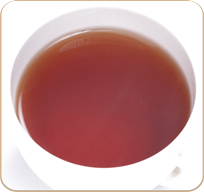 A tangy and tart tea, cherry red liquor and very exciting to steep and drink.